DISCOVER THE SMILE FOUNDATION commissioned us to develop interactive artworks in the public spaces of Schneider Children's Hospital - part of the North Shore-Long Island Jewish (LIJ) Health System. The objective of Discover the Smile Foundation, Inc. is to transform children's healthcare facilities into magical, child-friendly environments, creating atmospheres that put smiles on young faces to help relieve some of the emotional stress of hospital visits for children and their families, and to positively impact the outcome of treatment. 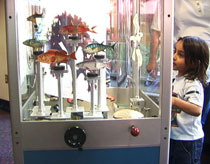 AQUA CIRCUS is an interactive virtual aquarium. kiosk outside the admitting office. created by kids and grownups. the infinite possibilities of the program. to Long Island Jewish Medical Center.